Hubei Cuisine consists of Wuhan, Jingnan, Southeast Hubei and Xiangyun cuisine styles. 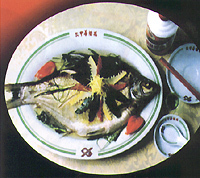 Wuhan Cuisine is known for its unique techniques of preparing delicacies from land and sea, freshwater fish and soup. Jingnan Cuisine, the origin of Hubei Cuisine, is well known for courses of freshwater aquatic products. Southeast Hubei Cuisine is rich in local flavors. Xiangyun Cuisine mainly takes pork, beef and mutton as the main raw materials, with a special taste of north Hubei. Tujia and Miao ethnic minority dishes in west Hubei attract customers with their own unique flavors. Famous dishes include Steamed Wuchang Fish, Mianyang Three Steamed Dishes, Huangpo Three Combinations, Xiaotaoyuan Soup Cooked over a Low Fire, Wangji Chicken Soup, Hongshan Vegetable Bolts, Huangzhou Dongpo Pork, Sweet Jujubes and Mutton, Wudang Hedgehog Hydnum, Soy Sauce Grass Carp, etc. Wuehang fish is the most famous in China. Also known as bream, Wuchang fish has a small head, a flat body, and refined and tender meat, high in protein. There are many ways to cook Wuchang fish, but the steamed Wuchang fish is the most delicious. The three steamed dishes refer to steamed fish, pork and meatballs. The people of Mianyang (present-day Xiantao City in Hubei) have steamed all their dishes since ancient times. After the three steamed dishes were introduced to Wuhan, chefs have made great efforts to improve them in terms of ingredients, operation and techniques. Hongshan District in Wuhan grows red vegetable bolts. As special local products of Wuhan, red vegetable bolts are crisp, tender, refreshing and tasty. As a traditional snack of Wuhan, three delicacies and dried bean curd sheets, golden yellow in color, is crisp outside and tender inside. As a unique food of Wuhan, hot dried noodles enjoy equal popularity with noodles cooked by whittling off the dough into the boiling of Shanxi, Dandan (spicy) noodles of Sichuan, noodles served with fried bean paste of Beijing. Wuhan people love to eat- steamed bread of flour as breakfast, which is yellow on both sides, crisp outside, soft inside, cheap but good.